For yucca moths, does (flower) size matter? In a paper just released online at Molecuar Ecology ahead of publication, genetic tests on moth larvae provide the latest piece to the puzzle of why there are two kinds of Joshua tree — because the tree’s pollinators need to match its flowers [PDF]. I’ve written extensively about the interaction between Joshua tree and its pollinators. Like all yuccas, Joshua tree is pollinated only by yucca moths. Female yucca moths collect pollen in special mouthparts and deliberately apply it to a yucca flower after laying eggs inside it. When the eggs hatch, the moth larvae eat some of the seeds inside the developing fruit. Yuccas prevent their pollinators from laying too many eggs by selectively killing flowers too badly damaged by egg-laying [$-a]. TOP: The two forms of Joshua tree (western type on left, eastern on right). BOTTOM: Scaled comparison of moth body sizes and tree pistils. To lay eggs in a flower, moths must drill from near the top of the pistil to the positions marked by dotted lines. Photo by jby, Illustration from Smith et al. (2010), figure 1. This last element of the interaction may have had significant consequences for Joshua trees’ evolutionary history. 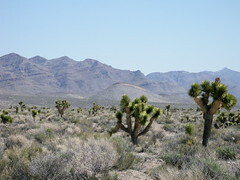 Joshua trees are pollinated by two different species of moths, which occur in different parts of the tree’s range: the larger Tegeticula synthetica in the west, and the smaller T. antithetica in the east. Joshua trees pollinated by the two different moth species are themselves different, both in their overall shape, and in the shape of their flowers’ pistils — specifically, the length of the route that a moth must drill to lay her eggs [PDF]. How does this difference in flower shape affect Joshua tree pollination? If a larger moth attempts to lay eggs in a smaller flower, it may be do more damage to the flower than the “native” pollinator would, triggering the tree to kill the flower. On the other hand, smaller T. antithetica might be able to lay eggs in a larger western-type flower without this risk. If this is the case, moths probably can’t pollinate western trees with eastern pollen, but they might be able to do the reverse. Such one-way pollen transfer between the two Joshua tree types could produce a population genetic pattern called “chloroplast capture.” Joshua tree pollen doesn’t contain the full genetic code of the tree that produces it — it lacks the genes contained in the chloroplast, the cellular structure that conducts photosynthesis, because pollen grains typically don’t have chloroplasts. The DNA in the cellular nuclei of newly-formed seeds is a mixture of nuclear DNA (nucDNA) from a pollen grain and from one of their “maternal” parent’s ovules, but they get all their chloroplasts, and chloroplast DNA (cpDNA), from the ovule. If moths carry pollen from eastern trees to western trees, then the seeds produced would contain western cpDNA, but also some eastern nucDNA. Asymmetric pollen transfer can lead to eastern-type trees with western-type chloroplasts. Figure 2 from Smith et al.(2010). This is what we’ve found in Joshua tree populations near the region where the two tree types and their pollinators come into contact. At these sites, trees look like the eastern type (meaning they likely have eastern nucDNA, though we haven’t tested that yet) but have cpDNA that matches nearby populations of western-type trees [PDF]. The genetic pattern is only suggestive of one-way pollen transfer between the two Joshua tree types, though. We haven’t yet tracked the movement of moths directly, or estimated whether they actually are less successful when laying eggs on the wrong tree type. The newly-published study provides exactly these data. My colleague Chris Smith placed glue traps on Joshua tree flowers at the contact zone to estimate how often adult moths of each pollinator species visited each type of tree in the mixed population. Adult moths were more likely to be trapped on their “native” trees, though they did show up on the other type sometimes. 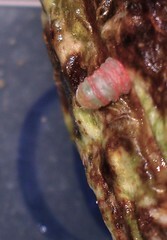 A yucca moth larva emerges from a Joshua tree fruit in the lab. Photo by jby. Chris and I then collected fresh fruit from trees in the contact zone, and caught yucca moth larvae as they chewed their way out. Chris and another coauthor, Chris Drummond, then identified the species of each larva based on their genetics (the two pollinators look very similar at that stage) — and in our sample, the pattern of specificity was even stronger than that in the adults. The larger moth species, T. synthetica, never emerged from fruits of the small-flowered eastern trees. The vast majority of larvae of the smaller T. antithetica were also found inside their “native” tree’s fruit — but a handful did emerge from large-flowered western trees. This mechanism could create the genetic pattern we see in Joshua tree populations. Larger T. synthetica doesn’t seem to lay eggs in (or pollinate) small-flowered eastern trees, but smaller T. antithetica can occasionally lay eggs in (and pollinate) large-flowered western trees. This should create asymmetric gene flow, with pollen moving from eastern trees to western trees, but not the reverse. The two Joshua tree types may not yet be reproductively isolated, separate species — but we won’t know for sure without looking at the plants’ nuclear DNA. As it happens, I’m working on that right now. First, the match between the Joshua tree flowers and the moths’ ovipositors suggested that coevolution might have molded the relationship between the plant and the pollinator. Second, because the plants are completely dependent on the moths for reproduction, the differences in the flowers might have caused Joshua trees to split into two different species. Yucca brevifolia in Tikaboo Valley, Nevada. Photo by jby. With permission from my doctoral advisor, Olle Pellmyr, I’ve just uploaded a unique video to Vimeo: a yucca moth laying eggs in, then pollinating, a yucca flower. I don’t know why I didn’t think of this earlier — it’s great footage, and deserves to be seen more widely. A female yucca moth mates, then collects pollen from a yucca flower in specialized mouthparts. She carries it to another flower where, as shown in the video, she drills into the floral pistil with her ovipositor and lays eggs inside, then climbs to the tip of the pistil and applies pollen to fertilize the flower. When the flower develops into a fruit, the eggs hatch and the caterpillars eat some of the seeds inside. Yuccas and yucca moths are completely dependent on each other [PDF] — nothing else pollinates yuccas, and the moths have no other source of food (they don’t eat as adults). Recently, the Pellmyr lab has shown that this interaction may be leading to speciation in one yucca species, the Joshua tree — Joshua trees pollinated by two different species of yucca moths have differently-shaped flowers [PDF], but these two tree types may not be totally genetically isolated [PDF]. I’ve written about this work before — for more information about the interaction, check out Olle’s publication page. A new Joshua tree study is just out in the current issue of New Phytologist, presenting an analysis of the environments occupied by the two different types of Joshua tree. The results demonstrate that the two tree types mostly grow in similar climatic conditions [PDF], which suggests that coevolution with its pollinators, not natural selection from differing environments, is responsible for the evolution of the two different tree types. The Pellmyr Lab has been studying the two types of Joshua tree, which are pollinated by two separate, highly specialized moths, for several years now. Previous papers have shown that the two types of Joshua tree, first described in the 1970s based only on their vegetative features, are most strongly differentiated by the shape of their flowers [$-a]; and that, although the two moths are separate species, the two tree types are not fully genetically differentiated [PDF]. The latest paper is a chapter from the dissertation of Will Godsoe, who just received his doctorate last week. It presents an analysis that sidesteps a fundamental problem with studying long-lived, specialized organisms — they’re hard use in fully controlled experiments. To determine whether the two types of Joshua tree really evolved as a result of coevolution with their pollinators, we’d like to be able to eliminate the alternative hypothesis that the two types evolved in response to different environmental conditions. 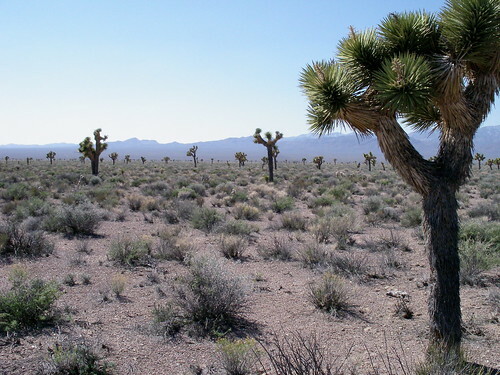 Except for a small contact zone in central Nevada, each tree type occurs in a different part of the Mojave desert, and the two regions do have some broad-scale differences in when they receive precipitation. Ideally, to determine whether two plants have different environmental needs, you just perform an experimental transplant, growing each plant in the other’s environment to see whether it fares as well as it does at home. This isn’t really possible with Joshua trees, which are pretty tricky to sprout from seeds (I’ve tried), and which, in any event, take something like twenty years to mature. So Will proposed to use niche modeling methods instead. 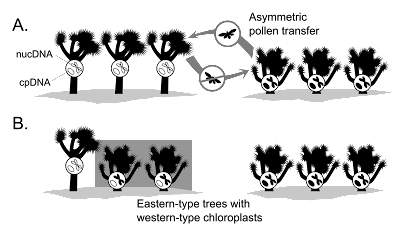 Niche models are statistical descriptions of environments where an organism is known to live, often used to predict where it could live. To build niche models for each type of Joshua tree, Will assembled location data we’d collected over several field seasons in the Mojave, then spent another field trip driving around the desert some more to fill in the gaps — he wanted locations where Joshua trees were definitely growing and where they definitely weren’t, to fully “inform” the models. Using the location data, it was possible to determine what kinds of climates each Joshua tree type tended to occupy by cross-referencing with existing climate databases, then fitting statistical models to the results. The models produced for each tree type could then be compared — and, for the most part, they’re similar. That is, if you collected seeds from one tree type, planted them where the other type grows, and waited around for a few decades to check the result, you’d probably find that it grew as well as it did in its home range. So, if differing climates don’t explain the origin of the two types of Joshua tree, does that leave no other possibility but the pollinating moths? Not exactly — there are lots of environmental variables that weren’t available for Will’s niche models, for instance, or there could be a third, completely unknown factor. But this does make coevolution with the moths a more plausible explanation. In light of some of our very latest results — which should be going to press fairly soon — coevolution is looking like a better and better possibility. The first publication from the Pellmyr Lab’s study of Joshua trees and their pollinators, in which we demonstrate significant, potentially coevolved, morphological differences in Joshua trees pollinated by different species of yucca moths, is now online at the American Naturalist’s website. 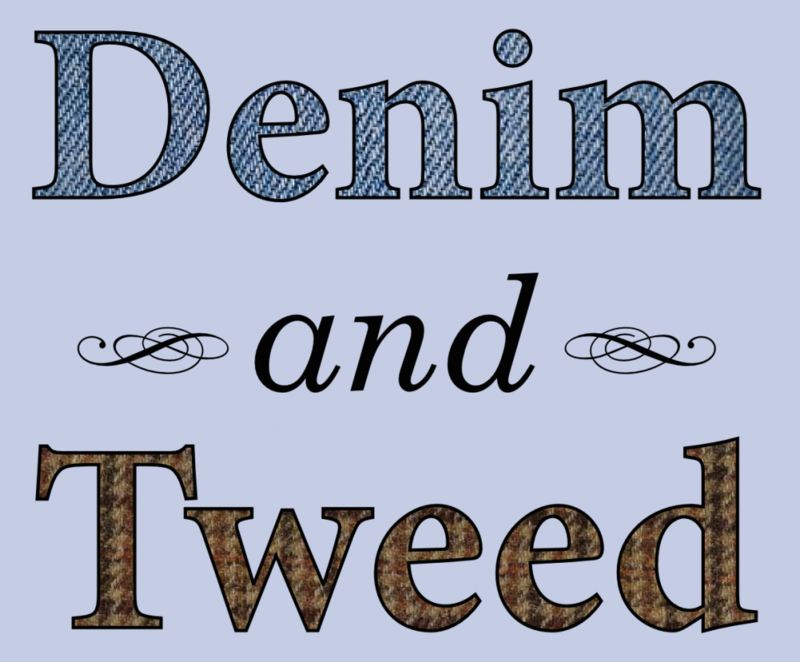 My understanding is that it’ll be in the print edition this June. Godsoe W, JB Yoder, CI Smith, and O Pellmyr. 2008. 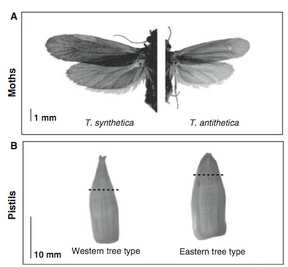 Coevolution and Divergence in the Joshua Tree/Yucca Moth Mutualism. The American Naturalist 171.